I like how the animations in this movie looks exactly like the illustrations in the original book. 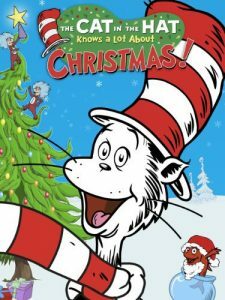 In the movie they show tons of characters from the books celebrating Christmas in their own way with The Cat in the Hat. 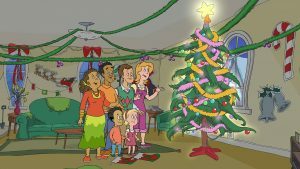 This teaches kids about different holiday traditions. 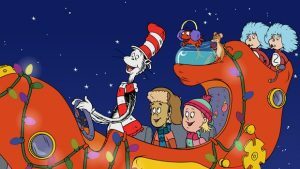 All The Cat’s animal friends each show their way of migration and use it to help The Cat bring Ralph home. This makes the movie very educational. For example, when they meet up with some dolphins the dolphins work with Ralph to bring the thingamajigger back to land. This shows how dolphins always work together to complete any task. A mysterious young woman, Hester Shaw, emerges as the only one who can stop a giant, predator city on wheels devouring everything in its path. Feral, and fiercely driven by the memory of her mother, Hester joins forces with Tom Natsworthy, an outcast from London, along with Anna Fang, a dangerous outlaw with a bounty on her head. KIDS FIRST! Film Critic Rohan F. comments, “The CGI in this movie is really impressive. The steampunk cities that fill the movie are thought out thoroughly. Shrike, a humanoid robot, is well designed.He looks very realistic, but with lots of sci-fi details.” See his full review below. 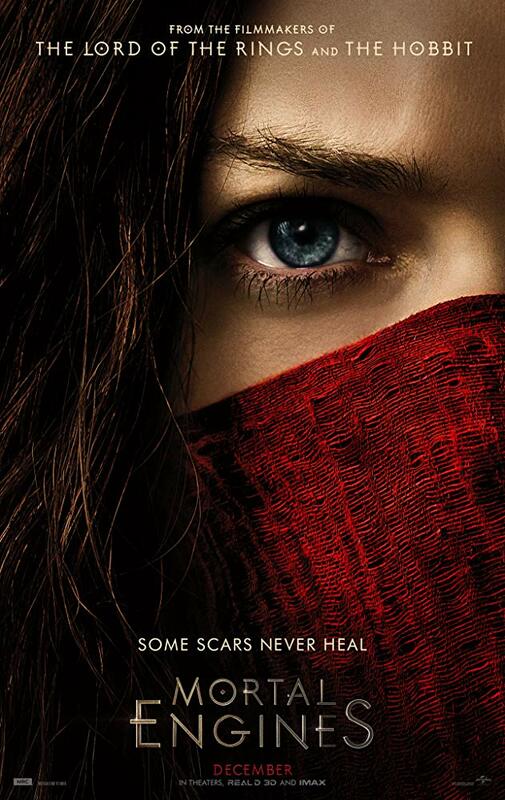 Mortal Engines is a visually incredible movie. Unfortunately, the story is quite hard to follow,and a lot seems to have been cut. The film is set in a post-apocalyptic future where civilization has been wiped out. What’s left of the human race has rebuilt cities as war vehicles designed to destroy and loot other cities. A girl named Hester Shaw tries to revenge her mother and stop London from destroying the shield wall, a wall that protects the peaceful, non-moving cities. I dislike how fast it moves. There are lots of action scenes and some of them get a bit too fast. On the other hand, these action scenes are well planned out and have lots of moving parts. In almost all of them, the characters are fighting while the city falls apart. The CGI in this movie is really impressive. The steampunk cities that fill the movie are thought out thoroughly. Shrike, a humanoid robot, is well designed. He looks very realistic, but with lots of sci-fi details. I specifically like how he can hold onto the ground by folding his feet down. This is a unique ability that isn’t over or under used. I enjoy Stephen Lang’s voice as Shrike. It gives an expected, eerie feeling to his character. The makeup for Hester’s scar is great, looking realistic but not too over the top. The moral of Mortal Engines is that you can accomplish anything if you work as a team. This is shown when Hester refuses to work with her friends until the end, when they must work together to stop London from destroying the shield wall. The music is often too overpowering. In several scenes, the music actually takes away from what is happening on screen. For example, in the final set it gets so loud that you can’t hear what the characters are saying. My favorite scene is at the beginning, when they show the landscape of this post-apocalyptic future and then, quickly jump into the action with a fun chase scene. This scene is very intense and shows what most of the movie is all about. I give it 3.5 out of 5 stars and recommend it to ages 12 to 15. It opens in theaters Friday, December 14, 2018 so look for it. Spider-Man: Into the Spider-Verse * A Masterpiece of the Superhero and Animated Genre! Miles Morales comes across the long-dead Peter Parker. This Peter Parker is not from his world though; he’s from somewhere else in the multi-verse. With Parker’s guidance, Miles will become Spider-Man: and through that he will become part of the ever-expanding ‘Spider-Verse.’ KIDS FIRST! Film Critic Nathalia J.comments, “The film is extremely colorful, unique and full of visual 3Danimation. The film certainly embraces the comic book style, which I really enjoyed. It definitely feels authentic.” Arjun N. adds, “Spider-Man: Into the Spider-Verse is a masterpiece of the superhero and animated genre. Groundbreaking animation and voice talent propel this above any other Spidey movies. Any fan of Marvel or even animation must check out this one-of-a-kind experience.” Sahiba K. wraps it up with, “Spider-Man: Into the Spider-Verse surprised me in its ability to create an original piece despite the several renditions of Spider-Man that exist! 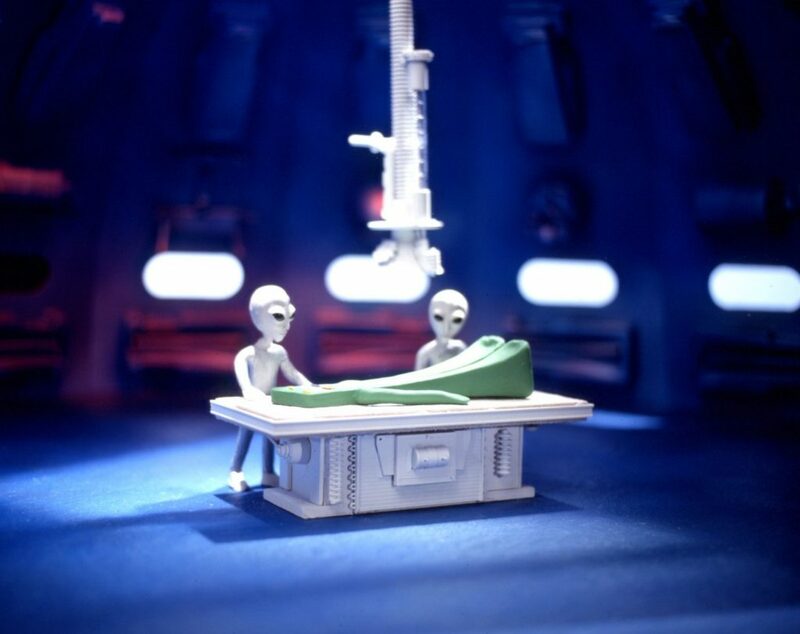 …The animation sets a milestone in the history of animation, for it is the first of its kind. Such aspects bring fresh artistry in animation that is rare in the film industry.” See their full reviews below. Are you ready for some live action! Seriously, Sony’s is kicking off something completely different. This fresh, funny, action-packed, intriguing and remarkable film is directed by Bob Persichetti, Peter Ramsey and Rodney Rothman. Prepare to get jump-scared from this perky piece of family entertainment. This American computer-animated superhero film follows Miles Morales who must juggle his high school life with his status as a superhero as he is introduced to the“Spider-Verse,” where there can be more than just one Spider-Man. Miles Morales comes across the long-dead Peter Parker. Peter Parker is not from his world though. He is from somewhere else in the multi-verse. With the help from Parker, Miles will become Spider-Man. The lead characters in this film are Miles Morales / Spider-Man (Shameik Moore), Gwen Stacy (Hailee Steinfeld), Peter Parker / Spider-Man (Jake Johnson) and Peni Parker (Kimiko Glenn). My favorite scene is when Miles Morales saves his entire city from the evil Kingpin and proves to the Spider-Verse he is valuable to the Spider-Verse and strong enough. The unique and brilliant 3D animation style is a fantastic aspect of the film. I admire Miles Morales’ strength which makes him a standout character. The film is extremely colorful, unique and full of visual 3D animation. The film certainly embraces the comic book style, which I really enjoyed. It definitely feels authentic. There’s one quote that they use a lot in the film from Peter Parker to Miles Morales, which is, “One thing I know for sure, don’t do it like me, do it like you.” I enjoyed this quote because it is meaningful and was the last words Peter said before he passed away. I give this film 5 out of 5 stars and recommend it for ages 6 to 18, as well as adults. This pure dorky fun film comes out on December 14, 2018 so look for it. Spider-Man: Into the Spider-Verse is a masterpiece of the superhero and animated genre. Groundbreaking animation and voice talent propel this above any other Spidey movies. Any fan of Marvel or even animation must check out this one-of-a-kind experience. The story follows Brooklyn teen Miles Morales (Shameik Moore) or the “new Spider-Man,” after he is bitten by a radioactive spider. When Peter Parker, the original Spider-Man, dies, Morales realizes he is the only one left to save the city from the grips of Kingpin (Liev Schreiber). Kingpin threatens to risk all space-time continuum, which even brings new Spider-men from other dimensions and timelines. One such is another Peter Parker (Jake Johnston) who serves as Miles’ mentor. These Spider-men remain the only ones powerful enough to defeat Fisk and his maniacal experiments. Shameik Moore, as Miles Morales, is easily the movie’s best character and empowers in what is the first depiction of his character in a movie. His coming-of-age brings up most relatability and his perseverance only makes his origin story as compelling, if not more so as Peter’s. Jake Johnston, as Peter Parker, portrays the classic original well, but with neat nuances. His character is one that has suffered many setbacks and devolved to laziness, with his arc being a fun,unexpected diversion. Bryan Tyree Henry, as Jefferson Davis, charges his father-son relationship with much heart as he struggles to bond. His brother Aaron, played by Mahershala Ali, provides another compelling performance, as here mains a key inspiration for why Miles is who he is. 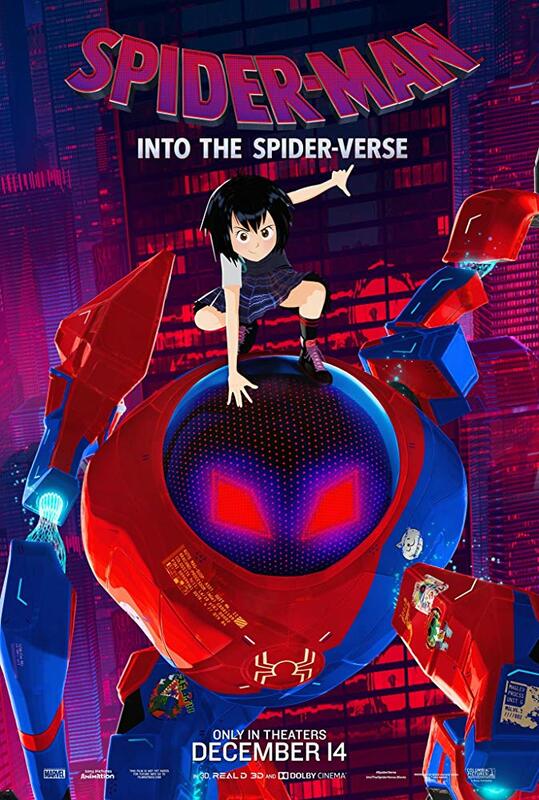 The Spider-verse, is complimented by the mysterious Gwen Stacy (Hailee Steinfeld), anime-inspired Peni Parker(Kimiko Glenn), Nicolas Cage who shines as the Spider-Man Noir and last, but not least, the wise-cracking anthropomorphic Spider-Ham (John Mullaney). Liev Schreiber brings a deep booming voice in the Kingpin that only adds to his menacing large physique. Bob Persichetti, Peter Ramsey and Rodney Rothman are experts in their class with many beautiful and visceral shots commanding the plot. The animation is something to be commended with its own identity taking homage from many comic books. My favorite scene comes from the central scene where Miles becomes one with his powers, as every shot has meaning and flair. It is truly inspiring and mind-blowing from a plot-driven and animated perspective. I could nitpick on the lack of a compelling villain at points or even some very infrequent awkward song placements, but in the end, everything comes into fruition and those are along gone afterthought. The message of the movie is about taking leaps of faith as Morales’s whole story revolves around just that in his quest to live up to the worthy Spider-Man mantle. I give this film 5 out of 5 stars and recommend it for ages 7 to 18 because of some intense scenes and themes. The movie releases in theaters on December 14, 2018 so check it out. Spider-Man: Into the Spider-Verse surprised me in its ability to create an original piece despite the several renditions of Spider-Man that exist!Spider-Man has been adopted by several films and TV shows in the past decades, yet Into the Spider-Verse is the most creative take on Spider-Man. The animation sets a milestone in the history of animation, for it is the first of its kind. Such aspects bring fresh artistry in animation that is rare in the film industry. The story follows Miles Morales, a young boy who faces pressure at high school and at home to be the best. However, when a portal to the multi-verse is opened, Miles is tasked with the responsibility of saving his hometown of Brooklyn.Along the way, several Spider-Men and Women meet who align with Miles and they become a close and loving family. The animation is contemporary and avant-garde, featuring pop art and street art. It is a tribute to the art of comic books, bringing them to life.It has several aspects of a comic book including onomatopoeia like“Pow!” and “Boom!” that are surrounded by colorful borders in several of the action scenes. Another example of the comic book charm occurs when an exciting fight move is taken by one of the Spider characters. At this time the screen splits into three, displaying the happenings in that instant, and adding to the thrill of the moment and overall fight. These small nuances accumulate, making me feel as if I had walked into a comic book. My favoritepart is the way that there are small tributes to the original Spider-Man comic books with different takes on villains such as Dr. Octopus and the GreenGoblin. They even made small references to the Marvel Cinematic Universe films that added to the ingenuity and display the directors’ attention to detail. The only thing that the film can improve on is the plot, because some of the characters are underdeveloped. Otherwise, the climax and storylines are unpredictable and engaging. The message of Spider-Man: Into the Spider-Verse is that all it takes to be what you want and do what you want is to take a leap of faith. I give this film4.5 out of 5stars and recommend it for ages 7 to 18. Be sure to check out Spider-Man: Into the Spider-Verse in theatres nationwide December 14, 2018. What would you do if you could be a superhero?What if you have no choice? From the very beginning, Spider-Man: Into the Spicer-Verse is very energetic and captures your attention. This animated film has impressive visuals. The music creates a fantastic rhythm. And you just want to watch more. The story follows a high school student named Miles Morales, who just changed school. He goes into an abandoned subway station with his uncle Erin and gets bitten by a radioactive spider. Ever since that day, Miles starts sticking to everything he touches. Then, he meets Spider-Man (Peter Parker), teams up with some friends from the same dimension and they attempt to save the world from the villain Kingoin. The story is very original and makes the impossible possible. It takes all the abilities of Spider-Man to far and beyond with its action scenes. The film also shows a very real family atmosphere and the humor is smart. I love the non-traditional characters and how they embrace diversity. And yes! Spider-Man is Latino and surely does speak Spanish! There are also some fun new characters. With this film, Marvel has created a film that celebrates comics, film and visual arts. Of course, it celebrates Spider-Man and makes this super hero relevant and contemporary. It is absolutely eye-poppingly beautiful and really pushes the boundaries of the genre with its colors, textures and camera movements. There are several different forms of animation in one film. You feel as if you are actually reading a comic book or the comic book is coming to life. 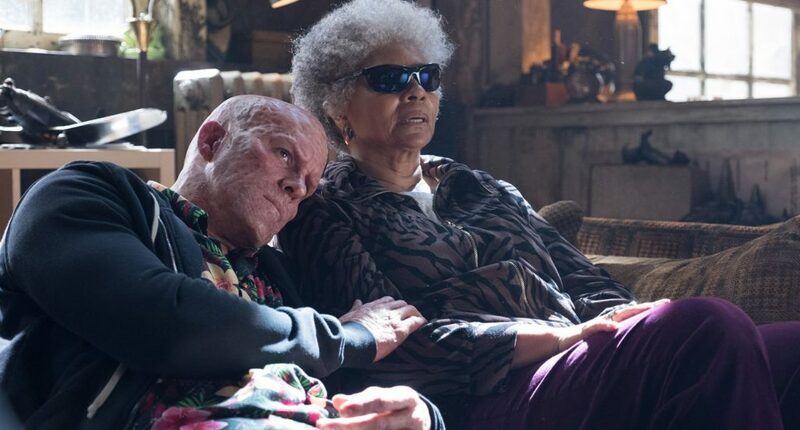 Naturally, the film does a very touching tribute to genius Stan Lee. I feel the filmmakers took some risks bringing new ideas to this iconic character which as been adored for over 50 years. The result is a must-see family movie that is even more appealing to new generations. I also love how this film is animated. It’s so different. I’ve never seen a film like this one. I think it’s very unique. Be sure to stay after the credits to see something very special, including another set of credits at the very end. This film sets a new era in animated movies. I recommend it for ages 5 to 18, as well as adults. I give it 5 out of 5 stars and include it in my Oscar predictions as a very possible winner. This is the film parents will love their kids to watch and kids will enjoy in many different ways. With great power comes great responsibility and we all can be heroes. This is the idea behind Spider-Man: Into the Spider-Verse – inclusion for all in the vast universe and the idea that we can all be heroes by making the right choices and doing our best helping each other in our everyday life. This film opens nationwide December14, 2018 at a theater near you. Be sure to check it out. Posted in Feature Film Reviews | Comments Off on Spider-Man: Into the Spider-Verse * A Masterpiece of the Superhero and Animated Genre! This lovely two DVD set comes with limited edition bendable Prickle and Goo figures. How awesome is that! The 1980s show was a hit when mom was growing up and it bought back so many memories for her. Welcome back Gumby and Pokey in this wild, wacky and inventive collection of 80s episodes, created and written by Joe Clokey. My favorite character is, by all odds Gumby, because he is always so energetic and happy. 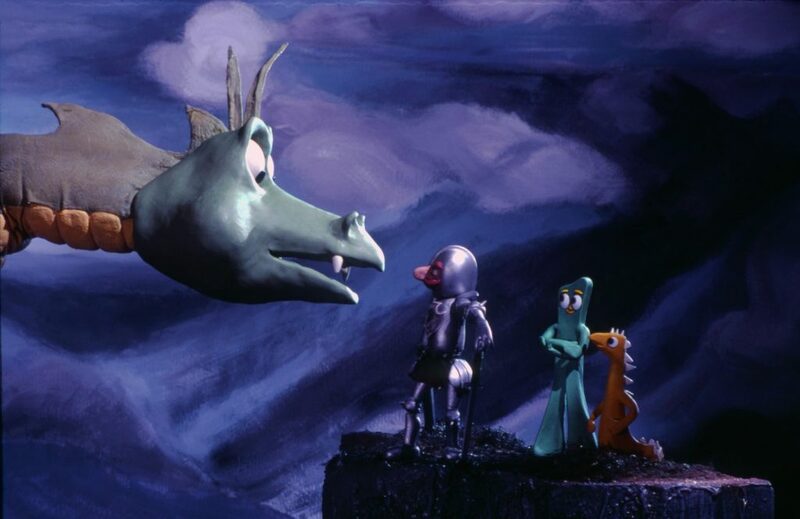 I enjoyed watching how Gumby and his genial friend Pokey take an adventure through an Ice Cave. I enjoyed this mirthful episode because it made me laugh. I really enjoyed seeing the characters come to life.The colors also really bring a sense of enjoyment. 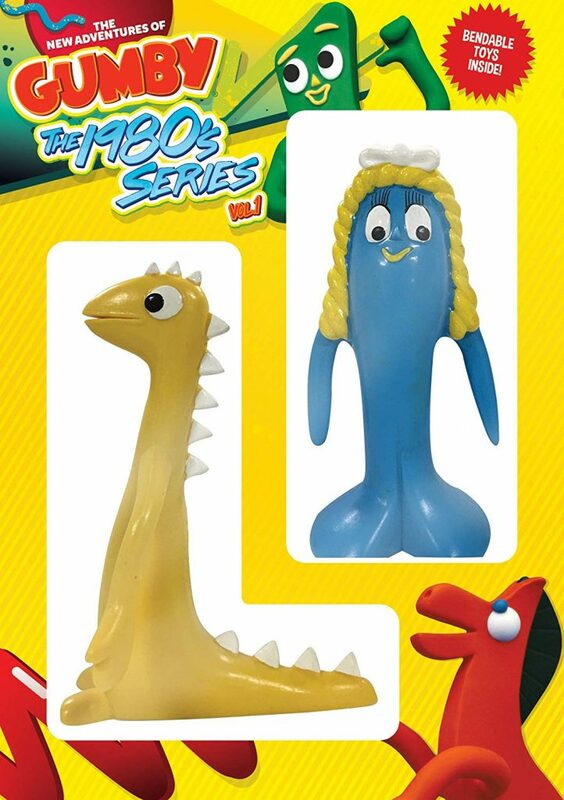 The characters in this series are Gumby, Pokey and Prickle, an adorable yellow dinosaur that looks like a dragon. Also making an appearance are Goo, the Blockhead, Professor Kapp, Dr. Zveegee, the Moon Boggles and Gumby’s parents, Gumbo and Gumba. I have to tell you about the story behind this release. Did you know that each episode and song was fully re-mastered from the original camera rolls and soundtracks?How cool is that! Here’s a chance to see Gumby as it has never been seen before. 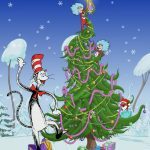 I give this DVD 3.5 out of 5 stars and recommend it for ages 3 to 7, as well as adults.This series is certainly unique and will definitely bring back memories if you grew up watching Gumby. This DVD is available now so, check it out. This DVD contains over 40 episodes that follow the vivacious chunk of green clay named Gumby and his friends – Pokey, Prickle the little yellow dinosaur and a blue flying mermaid named Goo. Gumby can go anywhere,including inside books, and turn into anything. The crew goes on lots of fantastical and quirky adventures together. One of the things I enjoy about this DVD is its diverse set of characters. This collection has all the favorite characters from the previous series such as The Blockheads and Professor Kapp. My favorite character from this collection is Gumby. This altruistic do-gooder is a character whose values are something kids can aspire to adopt. 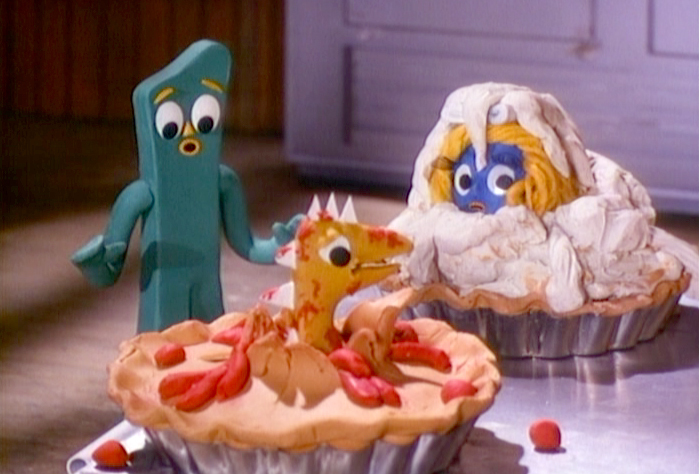 Gumby is one of the few characters that, if we all aspired to be, the world would be a better place. He is very likable and consistently fights for the common good. 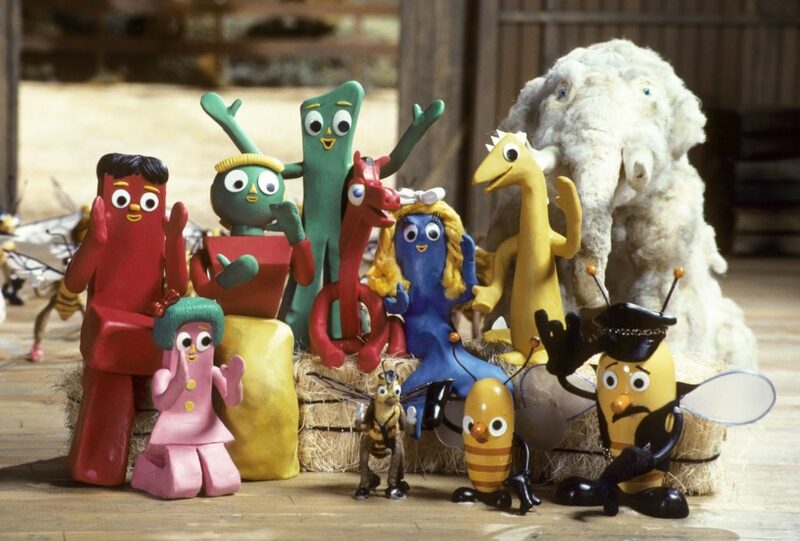 I also really like Gumby’s friends. This collection also highlights how pivotal these characters were to the series’ success. I really enjoy Gumby as a character, but without Prickle, Goo and Pokey as foils and characters for him to interact with, this series just wouldn’t be as good. Posted in DVDs Released | Comments Off on The New Adventure of Gumby: The 1980s Series, Volume 1 * Re-Mastered With Improved Video and Sound! 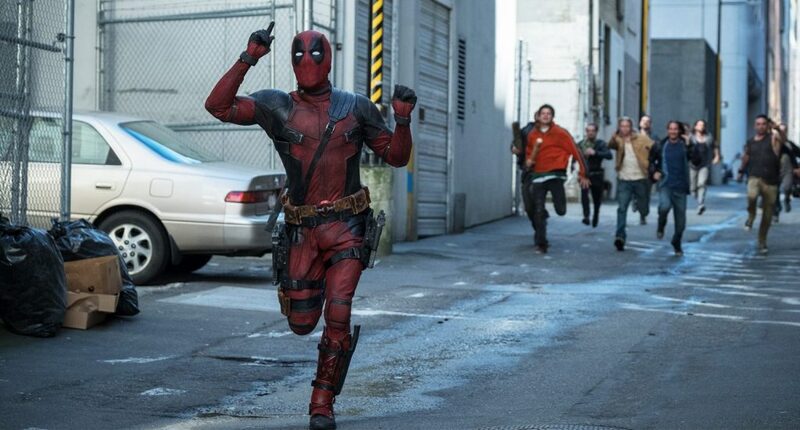 “Fox has been asking for a PG-13 basically since the start in 2006, “Ryan Reynolds told Deadline. “I’ve said no since 2006. Now, this one time, I said ‘Yes’ on two conditions. First, a portion of the proceeds had to go to charity. Second, I wanted to kidnap Fred Savage. 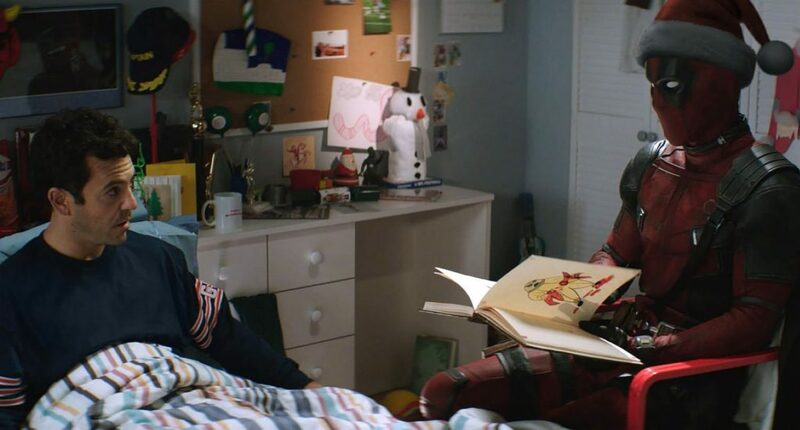 The second condition took some explaining…”Fred Savage will join Reynolds in new scenes for Once Upon A Deadpool in an homage to Savage’s starring role in the 1987 bedtime-story classic The Princess Bride. Fred remarked, “while my participation in this film was anything but voluntary, I am happy to learn that Fudge Cancer will be the beneficiary of this shameless cash grab.” KIDS FIRST! Film Critic Gerry O. comments, “Similar to the original film, the story is action-packed with some romance and drama, but always draped with the famous parody feel that creates an entertaining and comedic atmosphere.” See his full review below. 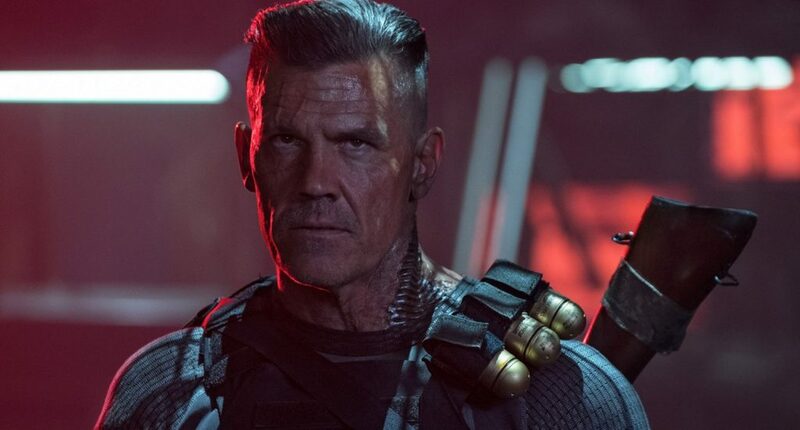 Once Upon a Deadpool delivers the same chaotic, dark and highly mature atmosphere that the previous film did and, despite being marketed as a PG-13 film, it still has the same amount of lewdness and foul language, even if the material merely gets hinted at instead of blatantly shown. While this does technically makes it a less severe rating, the re-cut is far from a family film that everyone can enjoy. Also, at times, the re-cut rearranges scenes and shots very uniquely to avoid showing anything mature. Mostly this works to tell the story,but at times it feels forced, as if the editor had to construct a film from sticks instead of clips, with awkward cuts and sequences. You are currently browsing the KIDS FIRST! News weblog archives for December, 2018.